He had apparently passed out and fallen off the park bench he was sitting on. 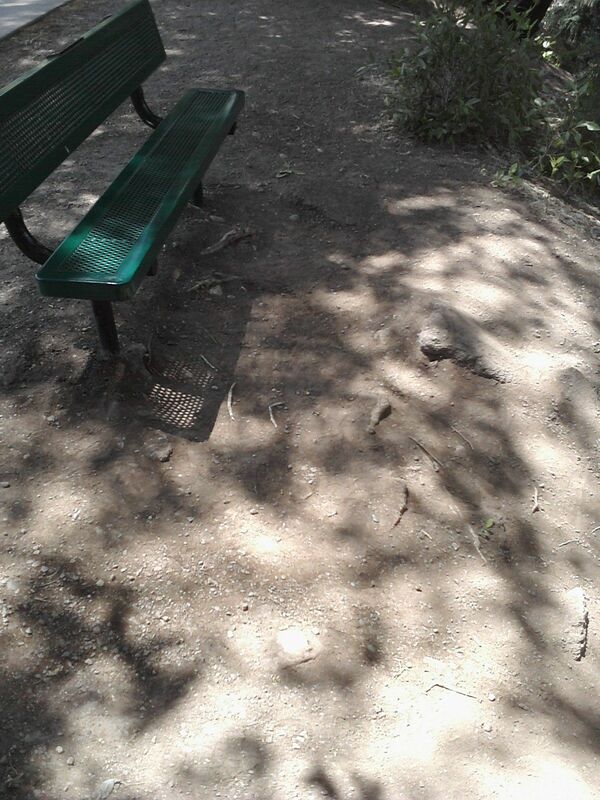 Unfortunately for him, the bench was facing the river and was at the top of a rather rocky and steep slope. His face and bare chest had received quite a beating on the rocks and he was lying there with his head about 2 feet lower than his feet, due to the slope. A companion and I were walking the trail when we noticed him lying there, unmoving. At first I just thought someone was joking around. Companion asked "Is he OK? Is he breathing?" I approached and saw that he was not conscious, and that his face was caked with dried, but fairly recent, blood (which had also soaked the dirt under his face). I leaned over and spoke to him. He groaned and his foot moved slightly, so I was glad he wasn't dead. His face was so bloody that I thought he might be the victim of a beating. I was trying to see how badly he was hurt while Companion, acting on her own, stopped some guys on bicycles to ask them what we should do. They still hadn't noticed the guy and just said "call 911" in a rather snarky tone of voice. Sigh. As I talked to the guy and tried to comfort him and size up his injuries, Companion called 911. The emergency operator asked Companion's name and phone number, and made an issue of similar irrelevancies. And asked where we were, which, being from out of town, she wasn't completely certain of. But Companion told her the name of the park that we were on the edge of, and the operator had no idea where that was. (So much for competent help.) Then she asked questions about how the guy had been injured- which she couldn't say for sure since we hadn't witnessed the event. Companion wouldn't come close to the guy so she shouted questions at me, which I then answered the best I could. About this time a park ranger on a little golf cart-type vehicle pulled up and said that someone had called "earlier" about a guy on a park bench who looked like he was about to fall off. Companion handed him the phone and I didn't hear what was said. Then a couple of other guys who had been watching came over and pulled the guy to the top of the slope and into a sitting position. I was really hoping they weren't creating more injuries by doing so. One guy had some paper towels and water and let the injured guy clean his face; he seemed to only have a bloody nose, a gash over his nose, and maybe a bloody lip. And he had a pretty nasty bruise on his chest, too. Eventually the EMTs arrived (parked far away and sauntered slowly over to the scene), and a cop showed up soon thereafter. The EMTs helped the guy to his feet and, with a person on each arm, walked him across the park to the ambulance. The cop stood there looking around. All the "authorities" assumed the guy was a drunk homeless man who more or less deserved his injuries. I did notice, however, that his work boots were nearly new, and his jeans were not badly worn. Perhaps assumptions were wrong. Homeless or not; drunk or not, the guy deserved compassion. Which illustrates a few things you might want to keep in mind. If you have a medical emergency, try to make sure you are not in an area known for being a homeless/drunk hangout, otherwise assumptions that could affect the quality of your care could cause problems. Calling 911 is not the best thing to do, even if you are not concerned with avoiding "Imperial entanglements". In fact, from what I heard of the conversation, the operator was almost useless. And, as always, why does a medical call "need" a cop to show up? It doesn't! And, people really are not very observant- or if they do see something, would rather pretend they don't if it might make them uncomfortable or inconvenience them. All in all, I doubt I handled things as well as I could have, and I will strive to do better next time. It sounds as if you did fine. Companion was a little quick on the dial; I'm guessing you discussed this with her and she'll check with you before calling 911 in a similar situation in the future. I have discussed it in the past, but she'll do what she'll do. She does not share my insight (although the 911 operator's behavior did confirm for her some things I have said). Thank you for helping a fellow human being. Not sure how much I helped, but at least I did no harm.